Special thanks to Eve Blanchard for providing her time and expertise in responding to your questions below. Q: Is there any way I could have tulips planted in my yard here in Tucson, Arizona? A: You live in an area where winters rarely or never reach freezing temperatures, so tulips won’t thrive there. But you can get them to grow by simulating winter. Place your tulip bulbs in a paper bag in the refrigerator and chill them for six to eight weeks. (Try to keep them away from ripening fruits; these produce ethylene gas, which can harm the flower buds inside the bulbs.) Plant the bulbs outdoors from late November to mid-December. You should enjoy a spring bloom, but if you want to keep them coming back, you’ll have to follow this routine each year! Q: We came to school today to find all 50 of our Red Emperor tulips in glorious bloom! As one student commented from across the playground, it looks like part of the school garden is on fire! The tulips, while being just beautiful, seem stunted in height, and we are curious as to why this might be... It is important to note that the same is true of MANY of the tulips in our larger neighborhood.....Throughout the Seattle area, tulips seem to be a bit vertically challenged this year! We are wondering if this may be due to a frigid cold snap that occurred in March, after a couple of weeks of higher than normal temperatures and sunny days..... Still, they are just fantastic, and everyone is commenting on how wonderful the huge patch of red is in our school garden. We wish everyone involved in The Journey North a happy arrival of Spring! A: Good thinking, Lafayette students. Yes, a drastic change in weather can cause tulips to be stunted. (They are a bit more heat-sensitive than daffodils and other spring bulbs.) This often happens when a warm spell is followed by a cold snap. When I looked at this 3-month graph of average temperatures in your area, I saw some real fluctuations! Your warm January weather (or a warmer winter in general) could also break your bulbs’ “dormancy” too early. Most tulips need 12 to 16 weeks of underground chilling in order to grow and bloom well. But it sounds like you have beautiful blooms, so I’m sticking with my theory that temperature fluctuations were to blame. If you had told us that only your tulips were stunted, but not tulips elsewhere in the neighborhood, I might have made one of these conclusions: 1) you planted them too late, so they weren’t chilled long enough or 2) they were in soil that was overly compacted or wet. So, you see, even “experts” have to consider the data and try to come up with explanations that seem to fit. No one knows all the answers. That’s what is so exciting about science! Q: How can I keep cut tulips from flopping over the vase? They were perfect, then I changed the water in the vase and even before I could get them back into the vase they were all wiggly! A: Good observation! I suspect that many of us have seen that happen, but few of us wonder why it does. 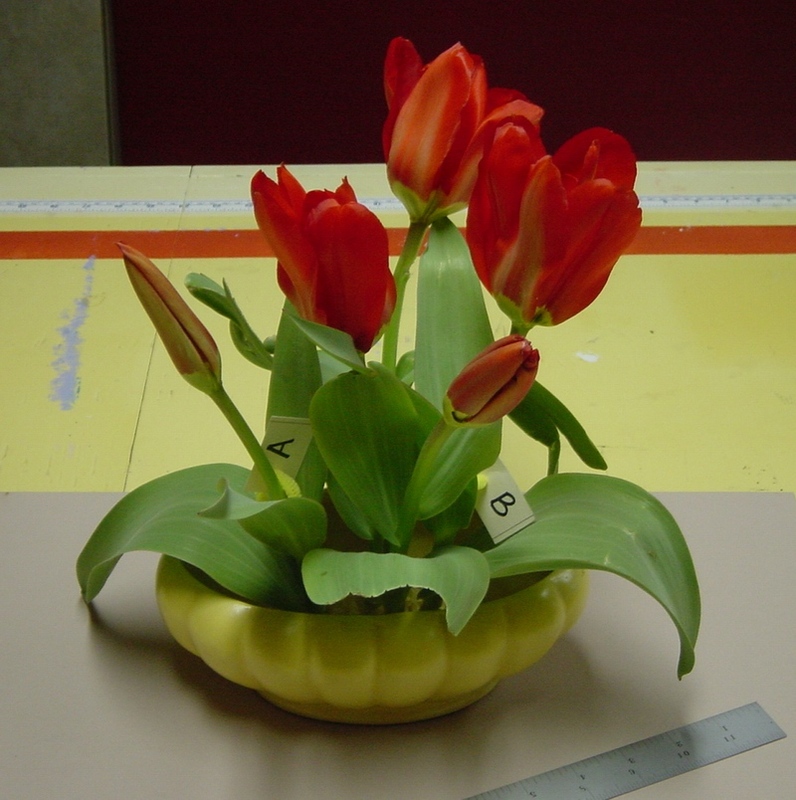 Unlike most flowers, tulip stems keep growing in the vase -- sometimes as much as an inch or more after being clipped. As the growing stem responds to sunlight and gravity, it bends, twists, and weaves. This “dance” can actually be recorded on stop-action film. To keep your tulips from flopping, you can try cutting them very short. TRY THIS: Make an experiment! Cut and measure a few tulips then put into a vase. 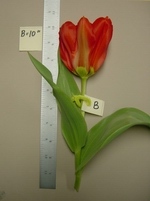 Periodically measure the length of the tulip stems. Also watch to see what happens as the light hits the tulips from different angles. Q: This is the second year we have planted tulips. Last year our bulbs were improperly stored near some fruits and vegetables and had some visible mold. They emerged beautifully, but the blooms were white-ish and shriveled at best. We thought the mold was the culprit and were very careful about storage this year. This year our bulbs were very healthy at planting time. Again our bulbs emerged looking very healthy, but come bloom time they were deformed. We planted in the same spot as the year before. Can the mold live from year to year or do you have any other insight? We plan to plant in various locations on campus next year to test our hypothesis, but thought you might know what the disease is called and how to avoid it. Thanks!!! A: I’m glad to hear that you’re testing your hypothesis by planting in different locations. You are clearly thinking and acting like scientists! Tulip bulbs can develop different types of molds when they’re stored. For instance, if the mold looks blue or green, it is probably penicillium, which can severely damage tulips. Gray mold, which thrives in wet soil, starts on the root end and attacks the bulb. It can cause the emerging plant to wither and die. Did you dig up any bulbs and observe what was happening underground? • Don’t plant bulbs that are badly damaged or moldy. Tip: Healthy tulip bulbs will sink in water, but decayed bulbs will float. Try testing some yourselves! • Plant tulip bulbs in well-drained soil. • Clean up leftover plant material once bulbs have bloomed and leaves have died back. P.S. Factors other than mold can cause your tulips to be deformed. For instance, in your area, warm winter weather could break bulb “dormancy” too early. Most tulips need 12 to 16 weeks of underground chilling in order to grow and bloom well. Did that happen in your area this past winter? Q: We started a family tradition up here in New Hampshire. Each Fall, Dad and his 2 sons plant 100 tulip bulbs and 100 daffodil bulbs. This has gone on for 9 years - slowly filling up the back row of our yard. Every year ALL daffodils return, but only 2 out of 20 tulips return. More tulips return the first year, then it quickly declines. Question: Why? I have heard dig em' up, too crowded, BUT in 1-2 years????? :> Hum...... with warm regards, thanks! A: Not all bulbs are created equal! Daffodils are less temperature-sensitive and more likely than tulips to return year after year. Tulips are not reliable perennials. (That is, unless they experience the cold winters and hot dry summers of their native central Asia!) But some types of tulips will return. The Red Emperor tulip we use in the Journey North experiment can bloom for two or more years. But it needs some help from you! First, a bit about what makes tulips tick: In order to bloom, a tulip uses the energy stored in the bulb. (It has everything it needs the first year!) The leaves then make food (through photosynthesis). This restores the bulb’s energy and prepares it to flower again. But if you cut the leaves back too soon, or if they died back for other reasons, the bulbs may not have had enough energy to bloom again. • Plant new bulbs in well-drained soil enriched with a low-nitrogen fertilizer such as well-rotted cow manure or special bulb fertilizer. • Each fall and spring, fertilize the plants as above. • After your tulip blooms fade, snap off the flower stems at the base. Let the leaves continue to grow until they die back naturally. • Journey North tulips must be planted 6 inches deep. But, tulips are more likely to bloom again if you dig them up and plant them 8 inches deep (from the bottom of the bulb to the top of the soil). 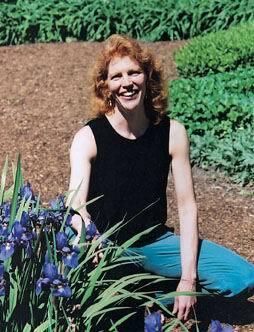 • Another way to get new blooms is to dig up an older bulb and look for smaller “daughter” bulbs near its base. If you separate and replant these 6 inches deep in well-drained soil, they should bloom in 2 to 4 years. Q:I bought a " Martha Stewart" TOP SHELF assortment of tulips for my across the street neighbor for her birthday in the Fall and planted them for her. To my surprise, it has been 4 years now and they ALL return in full glory! A: Consider possibilities based on my last response. For instance, your neighbor may have better drained soil than you do or she may fertilize more frequently. Also, “top shelf” bulbs are larger than other grades, so they have more stored energy to begin with. That means they’re likely to produce larger blooms and leaves. The leaves should make more food, giving the bulb plenty of energy to bloom another year. Q: Why would two blooms come from one bulb? (picture submitted to M. Hosier) Our hypothesis is that two bulbs are planted right on top of each other. It would have been planted that way by accident. Another thought was that the bulbs were so close they grew together. What did you find when you dug up your bulbs? Did it support your theory? Q: Why are the gardens along the west and east coast, farthest north blooming when it appears that only the gardens in the southern half of the United States are blooming? It looks as if you could almost draw a line straight across the US to mark the "Journey North" of spring by our gardens, except for these areas. Our hypothesis is that humidity has affected the blooming of these gardens. A: You’ve asked a great question! Water is involved, but perhaps in a different way than you think. 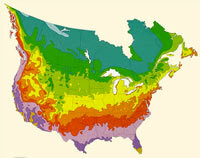 It helps to understand a bit about U.S. climate zones. 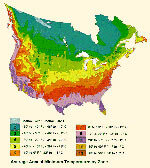 (These are regions that have different long-term temperature and rainfall patterns.) Coastal regions, which are influenced by the ocean, are called maritime temperate zones. Areas in the middle of the continent are called continental temperate zones. Here’s how they differ: Ocean water holds heat longer than land does, so land temperatures near oceans don’t change as much during the year as inland temperatures do. They are fairly steady across the seasons, with cooler summers and warmer winters than in inland areas. Areas in the middle of the continent, far from water, tend to have more extreme temperatures. They have very cold winters and hot summers. It can take longer for spring temperatures to rise enough for tulips to emerge. Winds also play a role. Our Pacific Coast has fairly steady temperatures, because prevailing winds come from the west over mild Pacific waters. But these westerly winds come across the extreme temperatures of the continent before reaching the East Coast. When you looked at both coasts on Journey North tulip maps, did you notice a difference in tulip emergence or bloom dates? Look at this map of minimum temperatures in the United States. What patterns do you notice? How do they compare with patterns on Journey North tulip maps? Q: We have not had a lot of rain and our tulip beds are dry and cracked. Should we water them? Please give specific details. Thank You. A: Yes, tulips should get about 1 inch of water each week in the spring. Otherwise, these living things will dry out. If you don’t have much rain, you’ll have to do the watering yourselves! Q: We are having trouble putting our observations on your site can you please send a detailed instructions. thanks We love this project. Thank you. A: We rely on all the citizen scientists involved with Journey North projects to help us create the "Big Picture" about animal migrations and seasonal change. We want you to be successful reporting in to the site! Here's how: Find the blue "Owl" button any page on the site. Click on it to take you to the "Report Your Sightings" and "Map" page. Enter your email address (registration email), press “Submit,” and fill out the Field Report with the event you are reporting. Q: I planted tulips inside and outside. The sprouts inside were green and the sprouts outside came up red at first, then turned green! I've really wondered about this. Does it have something to do with the weather? A: That’s a tough one! Here’s my guess: The red is actually a pigment in the tissues of the tulip plant. When the tulip is under any kind of stress, which could be the cold temperatures at ground level during emergence, the red will be visible. You can see this kind of pigment showing on leaves in the autumn when the movement of water and food is cut off the leaves before they drop. Q: On my Journey North tulip garden maps, it looks like most of the tulips that emerged and bloomed first, are near a coast of an ocean. Why is this? Thank you very much! -Jillian age 10. A: You’ve asked a great question! Ocean water holds heat longer than land does, so land temperatures near oceans are very steady. They don’t change as much during the year as inland temperatures do. Inland areas have much more extreme temperatures: very cold winters and hot summers. So it can take longer for spring temperatures to rise enough for tulips to emerge. Look at this map of minimum temperatures in the United States. What patterns do you notice? How do they compare with patterns on Journey North tulip maps? Q: We know that the flower that bloomed this year was actually made by the plant during the growing season last year. When we planted our bulbs just after Thanksgiving, we had some bulbs left over that just didn't fit in the beds we made. We planted those extra bulbs in pots and kept them in the refrigerator all winter. They emerged four days earlier than the bulbs in the ground! However after growing on the window sill, they produced healthy leaves, but the flower buds were just shrunken nothings. Why didn't the pre-made flowers develop like the ones outside are doing? A: Tulips can be tough to bring into bloom indoors. Something in the refrigerator may well have been the culprit! Here’s what I think happened: You may have had some ripening fruit, such as apples, in the refrigerator where your bulbs were stored. Many fruits produce a type of gas called ethylene. This can damage the flower buds inside the bulbs. Your warm windowsill may have inspired the bulbs to bloom earlier than the underground bulbs, but the flower buds were already damaged by the gas. • Use top-quality bulbs that are large and heavy for their size. • Use varieties that are described as suitable for forcing; they are the best bets. • Give indoor tulips at least 12 weeks of temperatures below 48 degrees F followed by 2 to 3 weeks at 60 to 65 degrees F. It can take another few weeks before buds are colored and green leaves, unfurled. Since 1995, experts have contributed answers to students' questions about each Journey North species. These questions and answers are archived in our FAQ's (Frequently Asked Questions) section. You can use today's Answers from the Expert above, along with those from previous years, in the activities suggested in the lesson, "FAQ's About Journey North Species"